Congregationalism is founded on Jesus’ teaching that “Wherever two or three are gathered in my name, there am I in the midst of them.” (Matthew 18:20) Each person has a unique relationship with God, but we live better when we walk together. Jesus Christ is Head of the Church. We have only one “boss.” All we do must have its roots in Him. Relationships are made by covenant. A covenant is a set of promises that bind people with each other and with God. Here’s our covenant. We rely on the Holy Spirit, to bind us together, to give us wisdom and insights. We believe that each person has gifts and connections with God that we need to be better church together. We are in relationship with other churches. Churches were never meant to go it alone, but to have meaningful relationships with sister churches locally and wider. Beginning in 1606, the first Congregationalists met in the Postmaster's House in Scrooby, England. 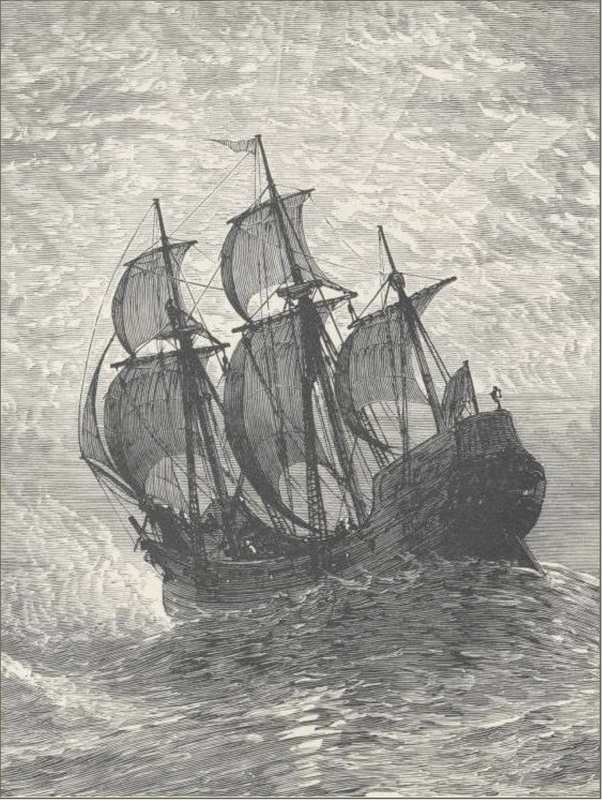 Some of the first Congregationalists, often called Pilgrims, sailed to America on this ship in 1620. Our pastor leads worship most Sundays and Bible Study most Monday nights. Built in 1914, the First Church of Squantum has been a witness to the grace of Jesus Christ in Squantum. (Taken at Easter.) When we serve communion, we remember Jesus' words: "Do this in remembrance of me." The worship space of the First Church of Squantum, ready for worship on Easter morning. Congregationalism comes out of the ferment of the Reformation in England. As people read the Bible in English for the first time, they struggled to reconcile the Church of England (CoE) with the New Testament Church. The Puritans concluded that the CoE could be “purified” from within. Small groups of people (Separatists) believed that worship should be fresh, pastors should be spiritual, church should be for those who want to be there, and that Christ was the Head of the Church (not the King). One of these groups began meeting in Scrooby, England in 1606. They called John Robinson as their pastor and moved first to Leyden, Holland and later, to the New World to escape persecution. Today, we remember these folks as the Pilgrims who traveled on the Mayflower, and celebrate their landing at Plymouth Rock on December 26, 1620. The Mayflower Compact, their guiding document, is the first democratic document for the Americas! At the time of the American Revolution, 90% of the colonies were Congregationalist. Indeed, the hotbeds of the Revolution were often Congregational churches (South Church in Boston for example) which also used their “meeting houses” (church buildings) for local town meetings. Emphasis on Education. Wherever Congregationalists went, they started colleges and universities. Harvard and Yale were originally founded so America could train its own ministers. Many liberal arts colleges across the nation were founded by Congregationalists, including Dartmouth, Bowdoin, Middlebury, Amherst, Wooster, Oberlin, Beloit, Carleton Grinnell, and Pomona. Tolerance and the pursuit of truth are some of the hallmarks of these schools. Ecumenical Movement. In the 1940s–1950s, a world-wide movement sought to unite all Protestant churches into a single United Church of Christ. In this effort, the Congregational Christian Churches (roughly 2000 churches) merged with the Evangelical Reformed Churches (along with some smaller denominations and groups) to create the United Church of Christ (UCC). Division. Roughly a quarter of the Congregational churches believed that the locally autonomous, Congregational church structure was threatened by this merger with the highly structured, presbyterian structure of the Evangelical and Reformed Churches. Many of the members were offended that the UCC would claim to speak for their consciences, on important moral issues of the day (the Vietnam War among others). This band of churches chose to continue as Congregational Churches, covenanting to form the National Association of Congregational Christian Churches (NACCC). The First Church of Squantum was part of the UCC until the early 2000s, when they tired of being told to give up. Subsequently, First Church joined the National Association. Community Church movement. In the 1980s, a nation-wide movement back toward the locally autonomous community church began. Some of these churches are organized by the congregation and some are really run by the pastor. Some choose to be completely isolated from all other churches, contrary to the earliest churches in the New Testament that experienced warm and compassionate relationships. Instrumental in the American Revolution — Most churches in 1770s were Congregational. Haystack Prayer Meeting — Kicked off modern Mission Movement. Strong Abolitionists before and during the Civil War. Famous preacher/author, part of Great Awakening (1730s), President of Princeton Univ.